Excerpt: The study of crystals (orderly, repetitive, three-dimensional atomic structures) through the microscope is essential to the identification of a wide variety of small particles. Essentially, all solid particles may be classified as ‘made up of atoms’ and either crystalline, non-crystalline, or microscopically and optically like a crystal but lacking a crystal lattice. One necessary requirement for a good description, and to show the orthographic projections, is to orient and roll the crystal, which is similar to the function of a universal stage or the spindle stage. 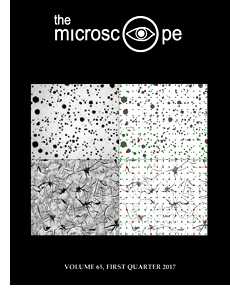 Abstract: Quantitative measurement of structures in both biological and inorganic specimens can be efficiently obtained by superimposing simple grids of lines and points onto images of surfaces or thin sections obtained by light and electron microscopy. In many cases, counting the intersections or ‘hits’ the grid makes with the structures of interest provides efficient determination of volume fraction, areas of surfaces (interfaces, cell membranes, etc. ), and lengths of linear structures (fibers, vasculature, etc.). In some cases, the number of objects per unit volume can also be determined. Counting also provides an estimate of the precision of the measurements and facilitates the design of experiments. Examples are shown covering a wide range of disciplines. Correction: The original print version of this article has an incorrect image of the ‘Completed and ready Duro-Tak ball’ for Figure 2. The original article and a Correction page is included in the PDF viewable from the link below. Excerpt: Columns aren’t easy to write, and this one is unusually challenging. The brief is to look back at 100 presentations given to the same conference [Inter/Micro], yet without it looking like a shopping list. This will be unusual — and it takes me straight back to 1969. If you were around at the time, it was an unforgettable year. Excerpt: The Microscope is publishing selected monographs from McCrone Research Institute’s ‘A Modern Compendium of Microcrystal Tests for Illicit Drugs and Diverted Pharmaceuticals,’ which contains 19 different drugs and their microcrystal test reagents. This installment includes four monographs for cocaine with the reagents gold chloride with acetic acid, gold chloride with hydrochloric acid, platinum chloride with acetic acid, and platinum chloride with hydrochloric acid. 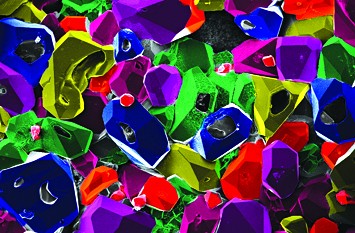 A color-enhanced SEM photomicrograph of potassium perchlorate from firecrackers after recrystallization from a water extract.